Crashlands, ladies and gentlemen, is how you make a game because only a real game can gobble up all that time and leave you wanting more. It’s fun, funny, engrossing, accessible, deep and beautiful. 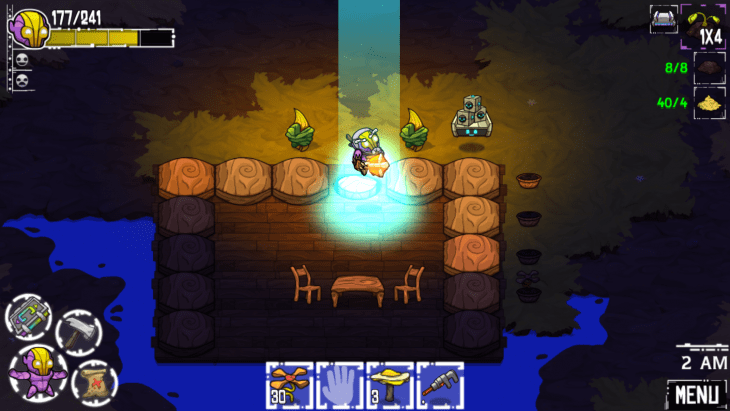 A crafting or RPG fan, or not, try it out – you won’t regret the time or money invested. 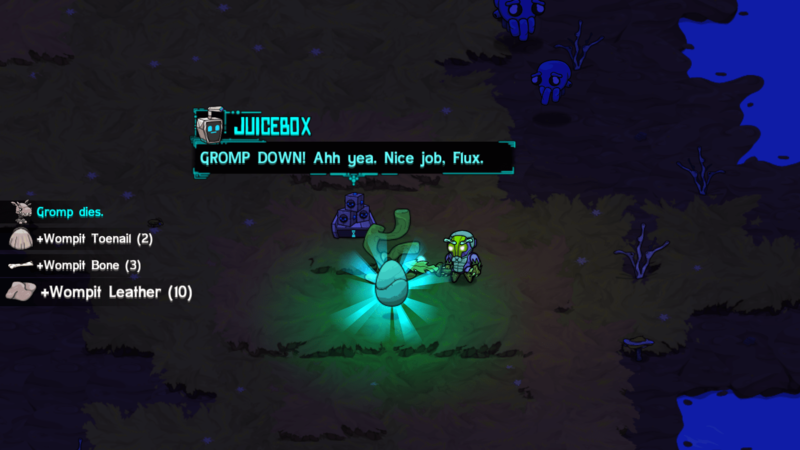 Crashlands is a top-down space melodrama / comedy / horror played from the perspective of Flux, a female space courier. It’s abundant in Friends-style jokes that make the story and gameplay all the more interesting to follow. Flux and her droid companion JuiceBox were on a delivery mission when a megalomaniacal alien with an unintelligible name attacked and destroyed her ship. Flux and JuiceBox land on an alien planet inhabited by a few sentient species, a ton of animal species, trees, weed and tons of hallucinogenic mushrooms. Oh, and the big neon green night bees that spit toxic ooze. You can tell by the premise they’re going to have a lot of fun with all the roots and mushrooms, and they would have if they did not need to deliver those packages. Stranded and lost, Flux and JuiceBox need to assemble whatever resources they can from the fertile land of the planet, craft them into tools that will protect them from the animals, kill the animals, tame the animals, craft animals and trees and stones into better tools, and finally construct a comms device to send an SOS signal. 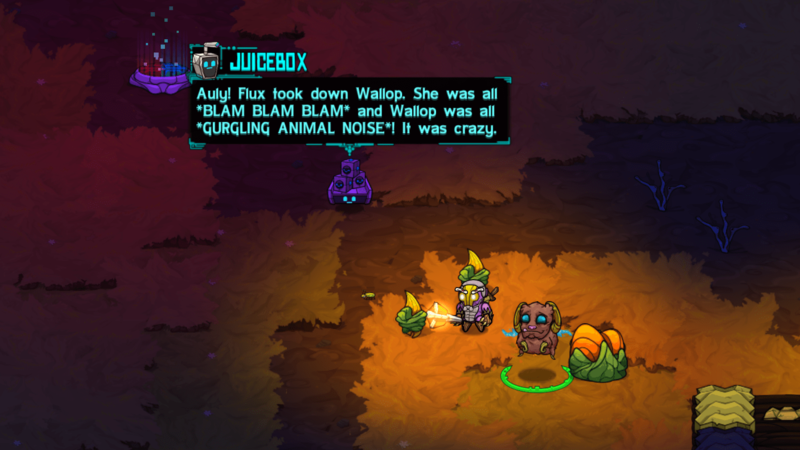 Of course, Flux gets to eat a lot of mushrooms that despite bringing a lot of joy also replenish her health bar – natural medicine at its finest. 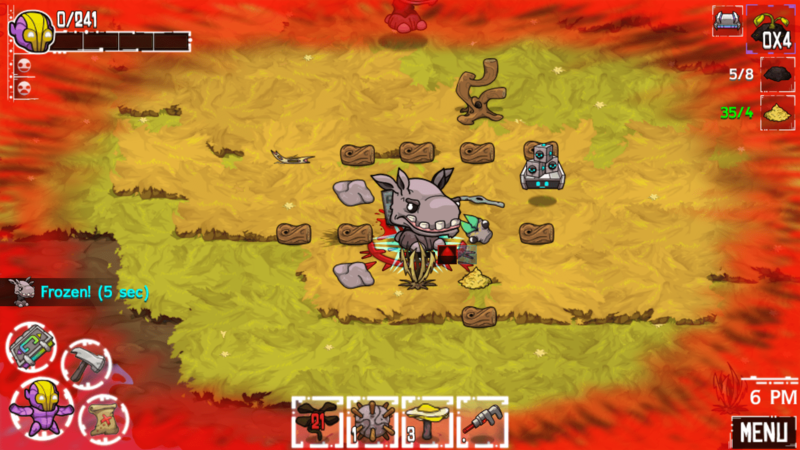 Being a top-down exploration, crafting adventure RPG, Crashlands offers several difficulty levels right from the start. The easy one does a great job of explaining the UI and the gameplay mechanics. You have several sub-goals and one main goal. The main goal is to build a comms device. 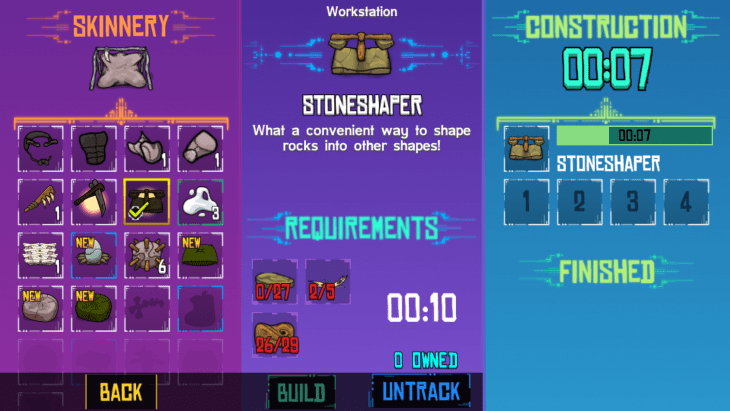 The sub-goals can be roughly rounded up as follows – build a base, collect the resources, build the production tools, then build fighting, harvesting and tech tools with your production tools. The pace of unlocking new recipes for more tools is even with the quests that bring in more stories. It’s amazing how these stories and numerous characters and species are catchy. In most fantasy games, I get bored with yet another Orc or Dwarf and their stories never hit the base with me. 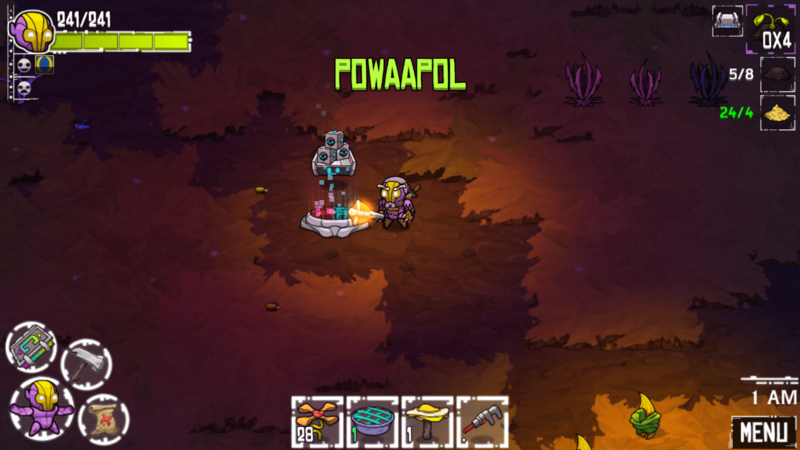 Crashlands, on the other hand, is vibrant with unique species, emotional stories, secrets and intrigue that make each quest memorable. You do have a list of pending quests in your panel, but in most cases, you remember them because these characters have personality. 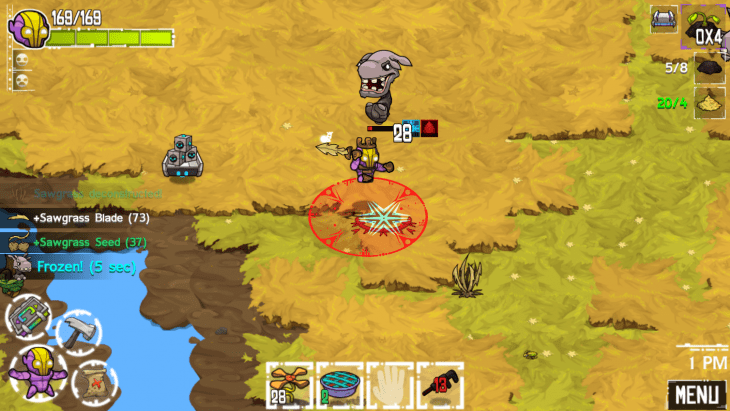 Lost lovers, a deceased grandson, a young tamed pet that needs care – Crashlands is a whole life. Crafting is easy, even though takes a certain degree of grinding for the necessary resources. Whenever you wish to craft something, just tick Track in the recipe’s tab, and you will see the missing component in your upper right corner. You can switch to a different recipe tracking at any time. 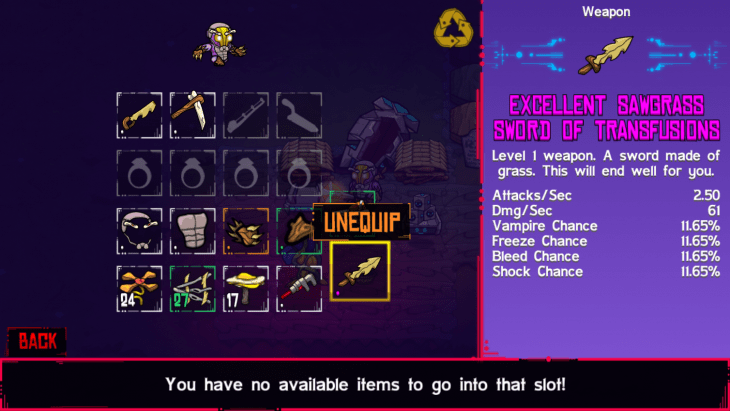 Equipping items from your character panel is intuitive. 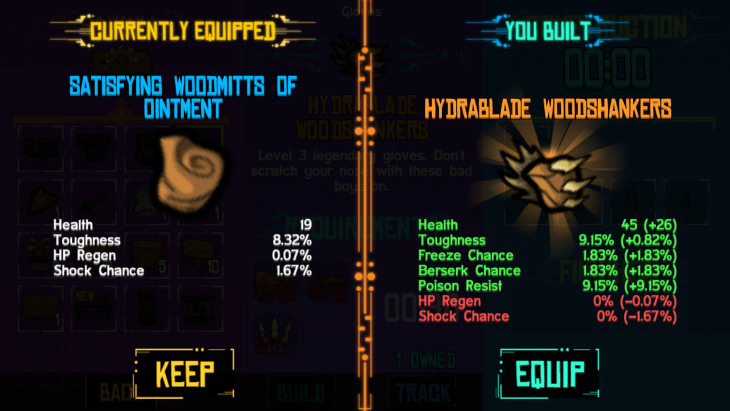 You start off with a basic wooden chest, gloves and helmet, and as you proceed, you will be able to craft more complex and upgraded clothes and weapons. The game conveniently takes away the spare taps needed to un-equip a saw and equip a sword when you switch from gathering mushrooms to fighting wompits and bees. The required tool appears in your hand whenever you need it. The buttons at the bottom show the equipped extra goodies, like bombs, healing mushrooms and flowers, potions, and such. Tap anywhere to go there; tap on an object to cut it into loot; tap on an animal to attack it; tap on a character to interact with it. It’s dead simple and has a minimum learning curve. The map only shows the areas you’ve been to, with the checkpoints as teleports, where you can go at any moment you wish. The map is huge, diverse and filled with adventures. Many quests drop a beacon on your map where you need to go to complete a quest, and thus you explore the planet and the intricate cultural traditions of its inhabitants. Did I say something about pets? Hell, yes, you will find alien eggs, build them incubators, hatch them, build their beds, feed them, milk them, take them on promenades. You will also make a garden and a yard where you will grow the extra supply of mushrooms and baconweed. You will build yourself a home – with floor, walls, rooms, doors, crafting tools, flower pots, lamps, pillows and beds, tables and chairs. It’s awesome. 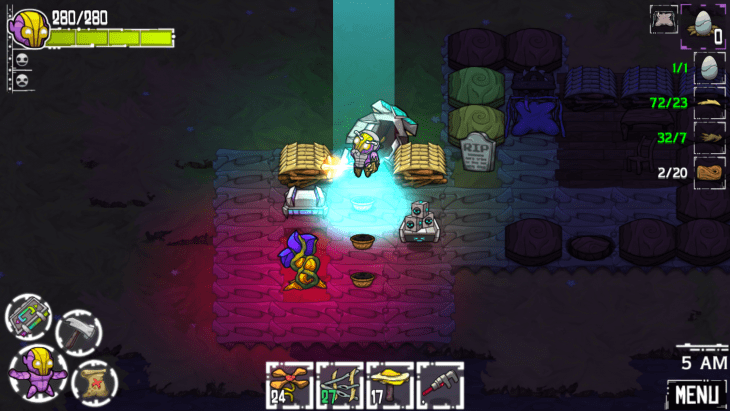 At the same time, Crashlands takes away the starvation, exhaustion and permadeath strain away from the classic crafting formula. You only eat mushrooms and flowers when you’re under attack. You don’t need to sleep. You respawn where you die and can collect the lost loot. At least in the easy and normal modes. Some boss fights will prove you’re not ready until you upgrade your gear and weapon. Fighting is quite simple. 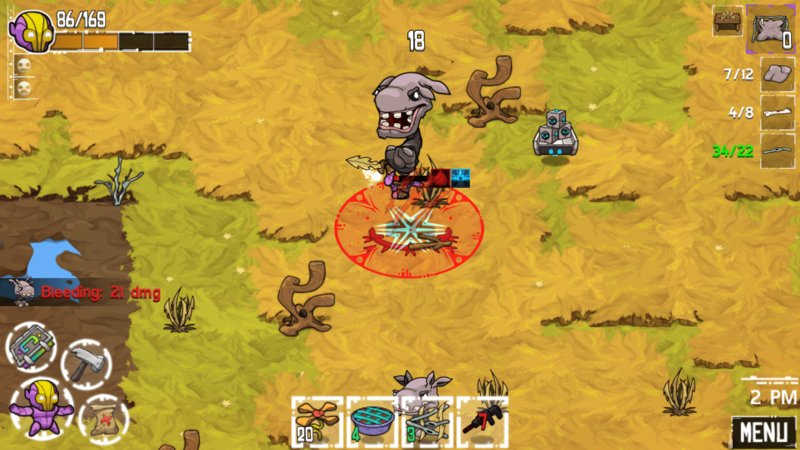 Once an animal wants to attack, the game shows where its attack will land, so you always have the time to escape or counter-attack. While you remain in the immediately proximity of the enemy, the combat is automatic. You can apply a bomb or other special weapon from your inventory, or eat a mushroom in the meantime. 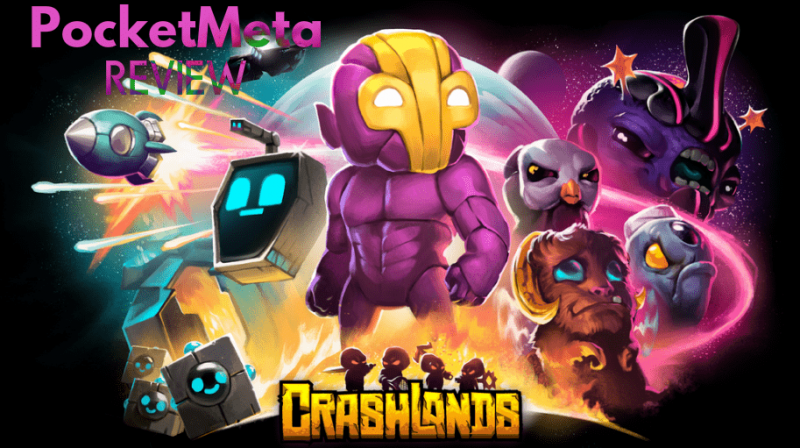 Whereas most survival crafting games feel like they’ve been developed with the uber-gamer in mind, Crashlands is accessible even for the kids, yet has die-hard difficulty modes for those uber-people. Weeks and months. 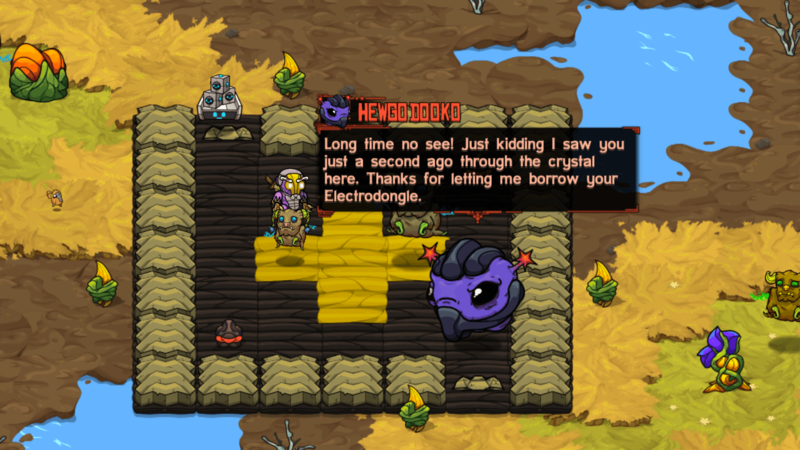 The world of Crashlands is big, the quests and stories abound, and the hilarious dialogues paired with self-irony make it an engrossing adventure perfect for long and short gameplay sessions. Mostly long. Because it’s addicting. If you ever played Shattered Planet, you will feel a familiar vibe. Since you are not that vulnerable, you get to take your adventure further each time. Saved teleports keep your progress whenever you get stomped on by a woolly wompit. Next time, hit it in the face first. 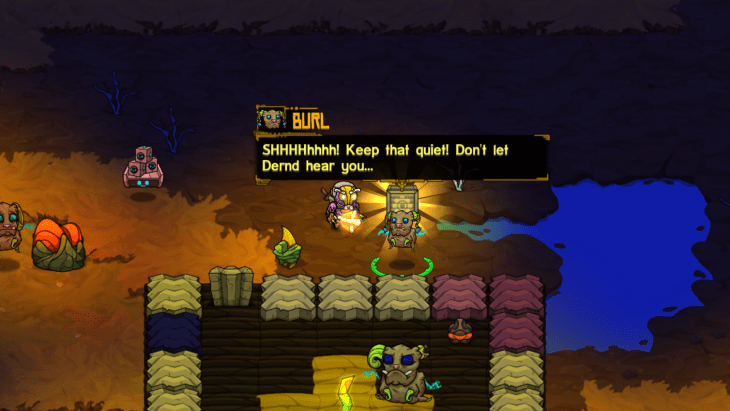 Crashlands is representative of modern mobile gaming at its best, and its visual style is brilliant. The day and night cycles add mysterious hues to Savannah while you decorate your house with neon lanterns and fancy glowing pillows. There is a lot more visual variety to the game than it may seem initially, and each new tool or item opens up even more of it. The freemium model made me forget how awesome it is to play without timers, IAPs and other caps. All-unlocked premium helps preserve the even flow of the gameplay. 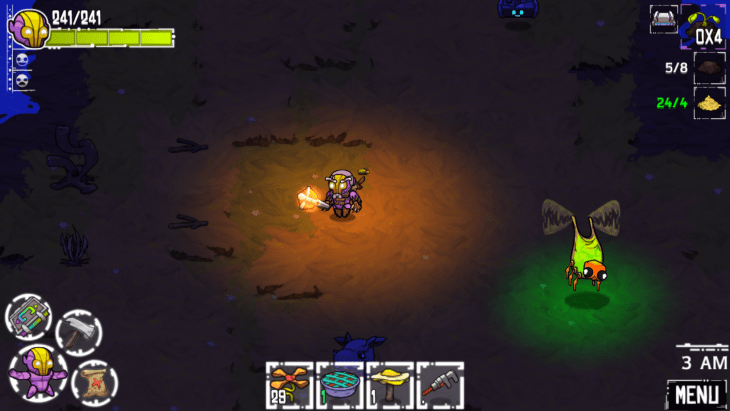 Crashlands is totally worth its price, and more. Smooth as butter. Cross-platform saves, so if you play on your iPad, you can sync the progress and continue on PC (yes, it’s on Steam, too). You need 1 GB of RAM for smooth performance. You can play offline. 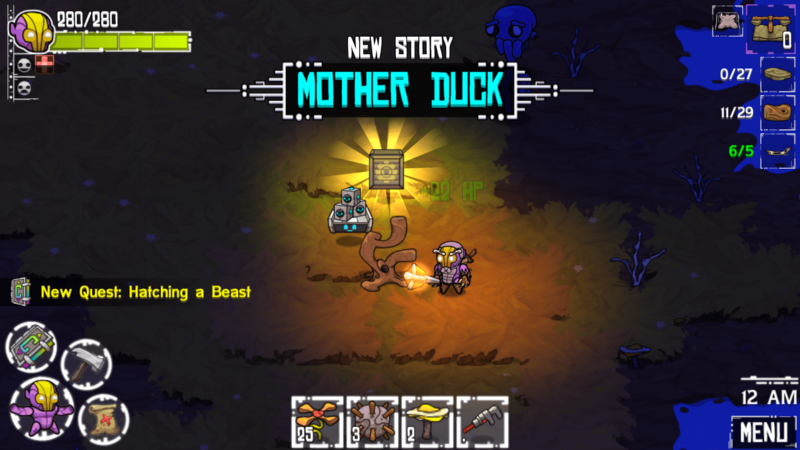 It is only after I got hooked on Crashlands that I read its developer’s post about making of the game and his personal and family struggle with cancer. An inspiring story of the healing power of art, human will, and a great sense of humor explained why Crashlands is so awesome. It’s a game with a heart. Created to entertain, it has its unique personality, and is a ridiculous amount of fun. That’s what resonates with people more than anything else. It’s interesting to play, and mobile game done right from every perspective. 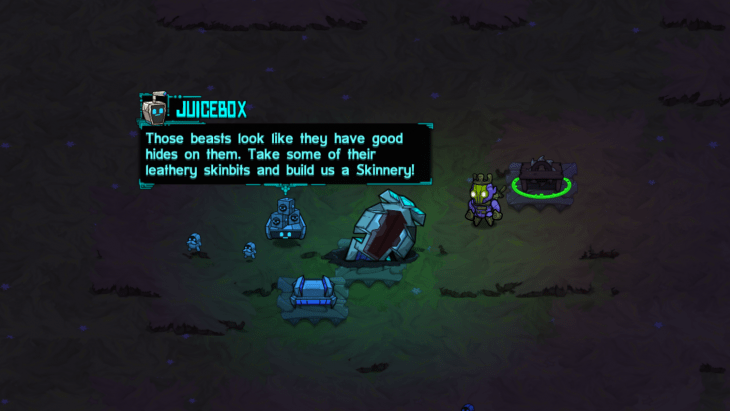 Even though 2016 is young, Crashlands is one of the best games of this year already. Perhaps, one of the best mobile games ever. Pure excellence.